The American Bottom is a broad lowland directly east of St. Louis, Missouri along the eastern shore of the Mississippi River. The area is about 175 square miles, and is a 10-mile wide floodplain of one of the largest confluences of rivers in North America. Throughout the American Bottom there are abandoned meanders of the Mississippi River, swamps, and bogs. 800 years ago it was also home to the largest pre-Columbian settlement north of present day Mexico City. This city is known as Cahokia Mounds today, and is thought to have reached a peak population in excess of 20,000 people at its height about 1250 AD. Why did Cahokia rise as a great city, and why did it eventually fail (in fact, it had completely disappeared by the time Columbus landed in the Caribbean)? The story is, of course, one of geology. Visiting St. Louis for the 4th of July holiday always means I am looking for some elevation to hike – a quandary along the Mississippi embayment. 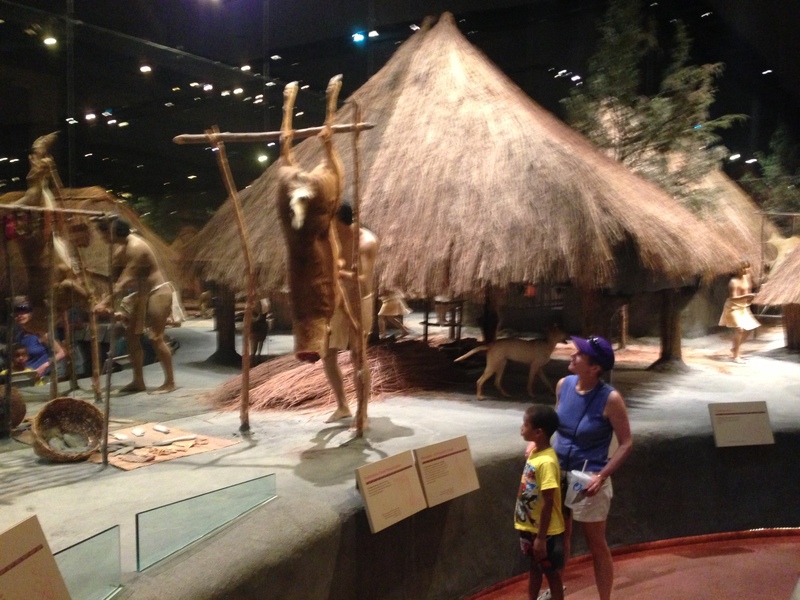 My son suggested that we go to Cahokia Mounds and walk the “hills” of the ancient city. I knew little about the people of the Mississippian culture that occupied the American Bottom from 600 to 1400 AD, except that they used the vast river system of what is the modern Midwest for transportation and that they build ceremonial “mounds” or elevated earthworks. Cahokia was a large urban center that grew to at least 4000 acres and had at least 20,000 inhabitants at its peak, and probably had governing influence over three times that number of people along the Mississippi River. 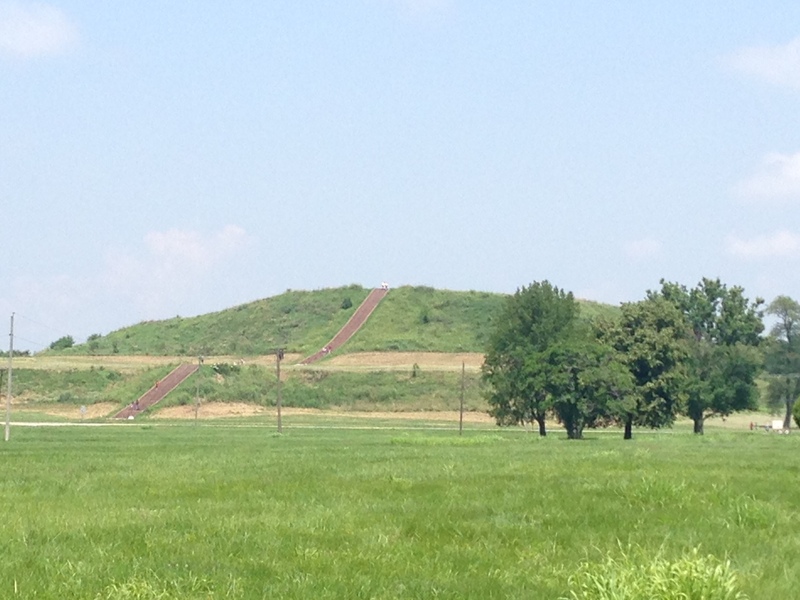 Today the Cahokia is a State Historic Site – a park that covers about 3.5 sq miles, and has 80 mounds. The largest mound is called Monks Mound, a four tiered platform approximately 100 feet high covering 14 acres. Monks Mound was built by hauling soil (which was rich in clay and organic materials) from bog quarries called “borrow pits”. Coring of the Mound shows that it was constructed in several phases, each from different borrow pits. It probably was assembled over a couple of hundred years, and its increasing height had to do with “elevating” the status of successive rulers. 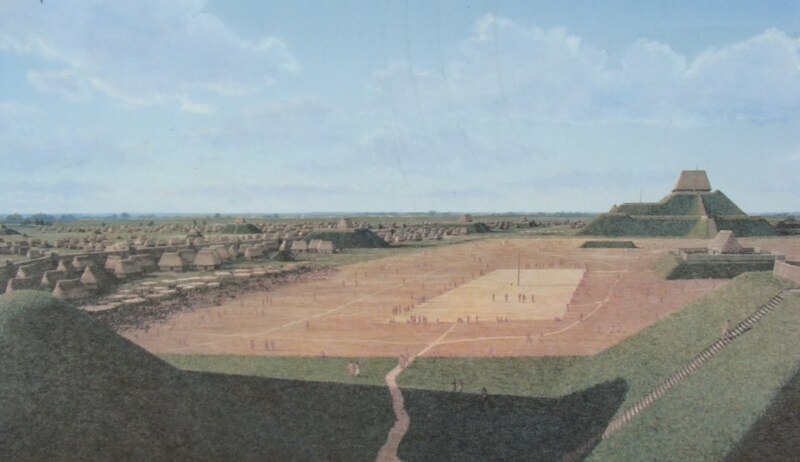 The top of Monks Mound had a large building or cluster of buildings- most modern interpretations are that these were the residence of the Cahokia ruler and court. Monks Mound derives its name from a community of Trappist monks that briefly resided in the mounds at the beginning of the 19th century and were thought to planned to build an monastery on top of the mound (luckily, the monks moved on before executing their plan). Monks Mound overlooked a large compound that contained ceremonial burials, a plaza (called the Grand Plaza), and storage facilities for foodstuffs. The entire region was surrounded by a wooden stockade complete with look out towers. Due west of Monks Mound is a curious circle of that is thought to have served the purpose of a sun calendar. 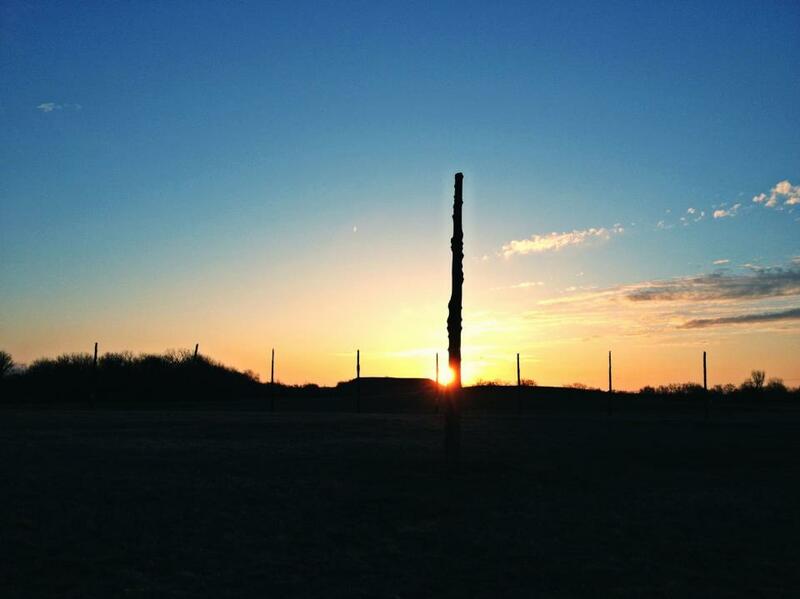 The circle had a number of wooden posts or pillars that appear to be aligned with shadows cast for a rising sun during the solstices and equinoxes. The functional similarity to Stonehenge in England has led to the naming of this site as “Woodhenge”. Why did Cahokia rise to become a major urban center? The most obvious explanation is geography based – the American Bottom is an incredibly fertile valley and the nexus of three major rivers, which could serve as a transportation hub. Just north of American Bottom the Missouri and Illinois Rivers join the Mississippi. The Missouri River is the longest river in North America (over 2,300 miles in length) and drains the Rocky Mountains of Montana and Wyoming. 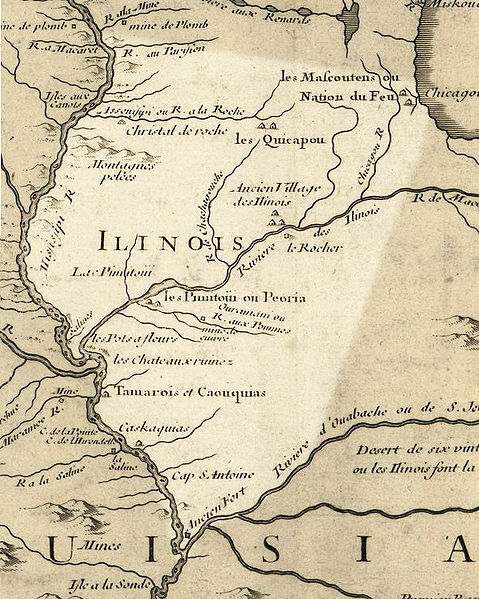 The Illinois River is much shorter (only 300 miles long) but claims a drainage basin of nearly 30,000 sq miles in Illinois and Indiana. The Mississippi River drainage basin covers the area between the Missouri and the Illinois Rivers – combined, the three rivers drainage basins cover nearly a quarter of the United States. 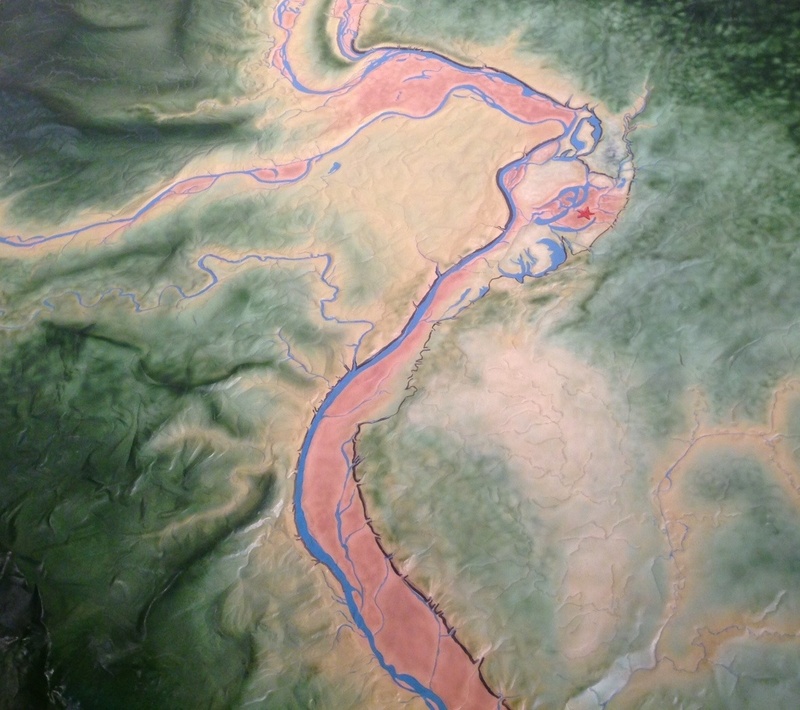 The wide extent means that at least one of the rivers would flood on an annual basis, and would deposit sediment, renewed with nutrients in the American Bottom. There is a theory of cities and urban centers based on their projection of power. There are “consumer cities” and “producer cities”. In this definition consumer cities are a center of government and military power – the classic example was Rome in the ancient world, and Washington DC today. Goods flow to consumer cities, and presumably, culture flows to the countryside. Producer cities, on the other hand, produce goods and commercial services and export these to derive their power and influence. Often producer cities rise in importance, become consumer cities, and eventually collapse when they lose their political power. Cahokia is probably an example of this producer-consumer-collapse cycle. The early Cahokia inhabitants developed a strong agriculture base – including annual planting of corn. The soil was rich enough to support the production of grains in excess of the immediate needs of the inhabitants; these grains (at least the corn) could be exported to surrounding regions in exchange for other goods. Copper from Michigan, sea shells from Florida, and gemstones from Mexico have been found in Cahokia excavations. The flow of wealth was facilitated by the strategic location of the city with respect to the rivers. This flow of wealth, in turn, fostered the growth of a governing structure, and Cahokia eventually transformed to a consumer city, and political center. It is clear from the archeology of Cahokia that structures associated with rituals were mostly built after 1100 AD; by 1250, at the height of the cities power, the core of Cahokia was dominated by ritual structures – a signature of government. The population of Cahokia began to decrease after 1250 AD, and by the beginning of the 16th century it was completely abandon. Some archeological work suggests that the diet of inhabitants began to change after about 1250 – a decrease in the ratio of protein to carbohydrates, which suggests that game animals had been hunted to scarcity. It is unlikely that a climatic condition like an extended drought had much impact on Cahokia because of the three great rivers, although flooding and consequent soil renewal may have become less frequent. However, it is clear that the collapse of Cahokia was more rapid than its ascent. There are no strong indications of the city being “sacked”, but other centers on the southern Mississippi River rose during the 15th and 16th Century suggesting either a political struggle for power, or simply filling of the void left by the Cahokia decline. The most likely explanation is a combination of environmental factors – a half a millennia of farming had depleted the soil and hunting had diminished the game animals such that the weight of the government could not be supported. Geology gave the city its birth, but in the end the resources were over taxed. 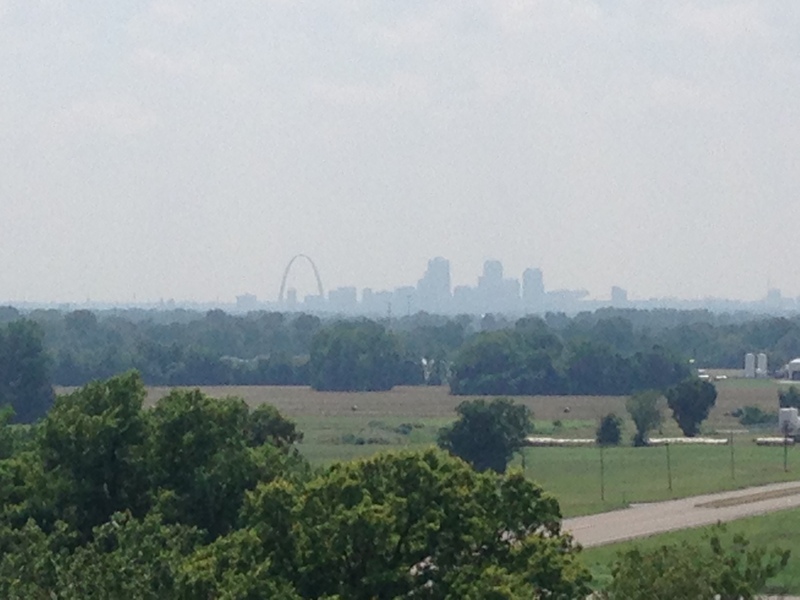 The picture above is from Monks Mound looking across the Mississippi to St. Louis on July 5, 2013. The atmosphere is pregnant with humidity, but the modern “Cahokia” is obvious. St. Louis was founded in 1764 by a French trading company based on it strategic location of the nexus of Missouri and Mississippi rivers. Today it is still a producer city – but how long that epoch will last remains to be seen. The Jemez Mountains are a unique alpine island created by the Jemez Volcanic Complex (JVC) that was active for about 800,000 years beginning around 1.4 million years before the present. The JVC lies along a line of volcanoes that arcs across New Mexico from the southwest to the northeast, known as the Jemez Lineament. 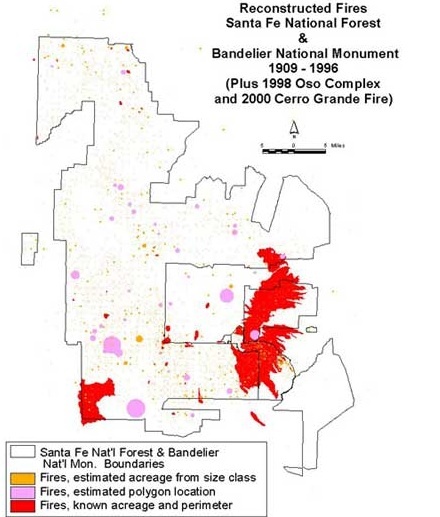 In the southwest the San Carlos Volcanic Field (in Arizona) anchors the Lineament, and it passes through Mt Taylor near Grants, the Jemez, and finally terminates in the Raton Volcanic Field. There is no real good explanation for the Jemez Lineament, and geologists continue to debate both its cause and significance. The JVC is the largest of the volcanic fields on the Lineament. The geologic map above shows the Jemez Mountains. The Jemez Mountains surround the Valles formed during the collapse of the JVC about 1.1 million years ago. In the middle of the collapse crater a great “resurgent dome” was pushed up by the death throes of a great volcano. This dome is Redondo Peak – which is not an eruptive volcanic cone, but an extruded dome. Redondo Peak is the high point in the Jemez at 11,258 ft elevation. The uniqueness of the Jemez was recognized by the first geologic expeditions of the west; John Wesley Powell himself visited the Jemez in the 1880s and described it as a giant volcanic field (anyone interested in the geology of the Jemez should read Fraser Goff’s book “Valles Caldera: A Geologic History”). The volcanic field and Redondo rise above the surrounding New Mexico highlands to form a roughly circular mountain range. This range has its own flora and fauna – or at least it did before the great fires of the last 25 years. Elevations above about 7200 feet were dominated by ponderosa pine and various fir and spruce. After a fire the pine is replaced by scrub oak and lower growing vegetation. 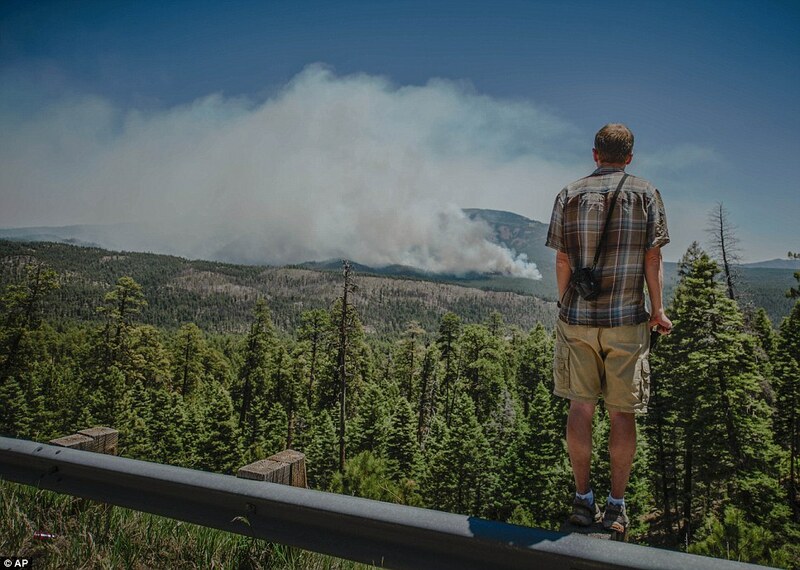 Craig Allen has studied the fire history and vegetation of the Jemez, and has found dramatic change. This change is from both fire and mortality of the pine forest due to prolonged beetle attacks. 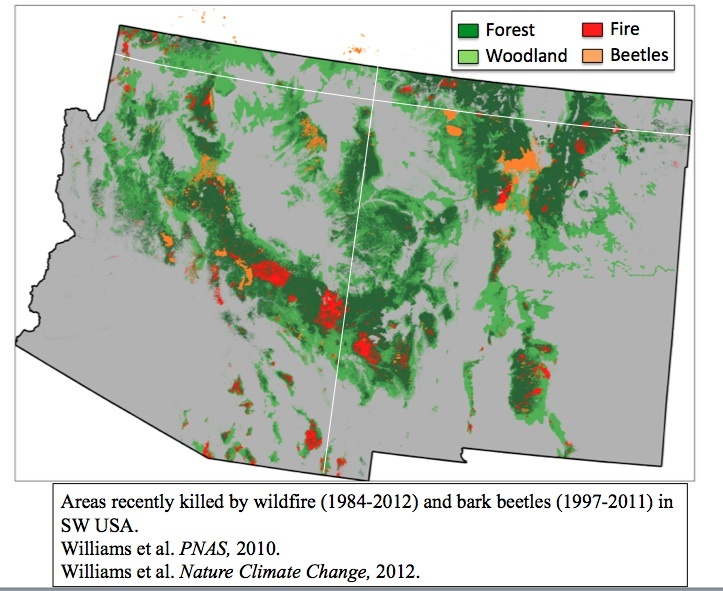 The figure above shows a color-coded map of the Pajarito Plateau, centered on Los Alamos, and where fire or beetles have affected our forests. In twenty years 90% of the forest have been subject to stress. The question of “why” is the Jemez burning can be partially answered by looking at the fire history of the mountains. There are various ways to do this, including coring trees looking for scars from ancient fires, and looking at the peats in the meadows within the Valles and looking for preserved ash and charcoal layers. When Allen and other researchers did this they reconstructed a fire record that stretches back nearly 10,000 years. There are literally tens of thousands of fires over this period, and some strong trends are worth noting in the last couple of hundred years. The figure above shows the location of nearly 5000 fires in the 20th century, along with the Cerro Grande Fire. The great bulk are small, local wildfires, probably almost always caused by lightning. There is evidence in the distant past of very large fires – probably as large as Las Conchas – all across the Jemez. There is a moderate correlation with those large fires and large-scale drought. However, before the mid-20th century wildfire was most commonly characterized by small, frequent fires. Beginning in the late part of the 19th century man began to have a significant impact on the ecology of the Jemez. Livestock grazing in the Jemez became “big business” and the removal of the understory grasses probably suppressed wildfire. The cows and sheep ate the grasses that supported spreading the fires. In the 1930s the Jemez became a lumber supplier, and the region began to be heavily logged. This is particularly true for Redondo Peak and the Valles Caldera which were in private hands, and were not subject to the regulation of the Forest Service. 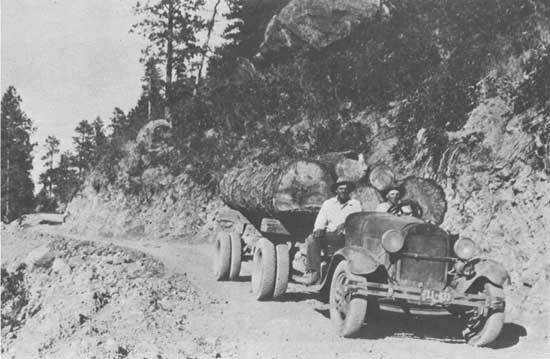 The picture above shows a logging road from the mid-1930 on the northwestern side of Redondo. Today, logging roads are still seen across the Jemez, especially as spirals up the various domes. The lumber “boom” ended, and the forests began to fill in. Livestock grazing dropped dramatically, and new Federal oversight of wildfire suppression caused the forest cover to densify. By the 1960s the forests were much more dense then 200 years previous. The pathways for fire were increasing. Over the last 2000 years there have been periods of drought and high precipitation. Around 1990 we entered a period of drought, and the window between 2000-2010 was likely the driest decade in a millennium. This drought stressed the trees, and they became much more susceptible to disease. In particular, the pine bark beetle attacked, and will eventually kill, more than 1.3 million acres of ponderosa pine in New Mexico and Northern Arizona in the period of 2002-04. The beetle problem is complex – stressed trees are one issue, but also the density of the forest allows the beetles to spread much more rapidly than in the past. 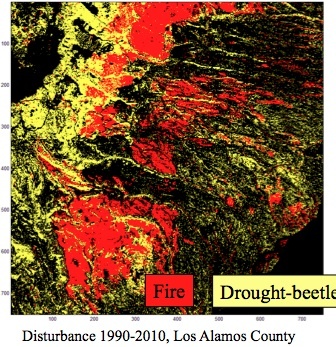 Nate McDowell and colleagues at Los Alamos produced the figure above that shows the loss of forest due to the beetles and fire. It is fair to say we are in a long-term, profound, change of our forest. The Jemez is not unique, but it does seem to be at the confluence of disease, drought, forest “management” and finally, the encroachment of man. Before 1950 the vast majority of wildfire was caused by lightning. However, since 1990 more than 85% of fires have a man-made fingerprint. For the four major Jemez fires in the last 25 years it is all man-made; The dome fire was caused by a camp fire, the Cerro Grande started as a controlled burn (what a total fiasco – and to this day an unpunished event), Las Conchas was started by a downed power line as was the present Thompson Ridge. 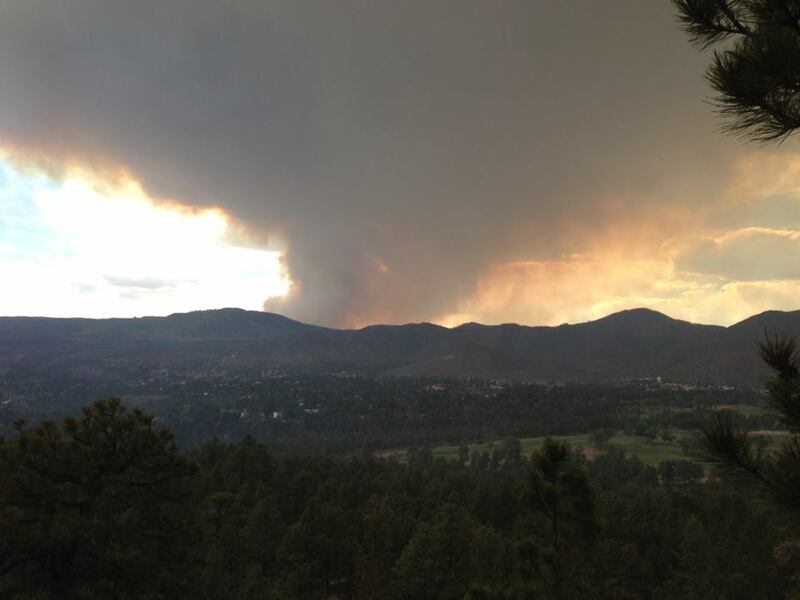 Although it is dangerous to predict the fate of nature, it certainly seems that large fires are going to continue in the Jemez for years to come. A break in the drought would help, but a short break would only promote the understory growth which would become the match stick once drought resumed. We are standing on the cusp of a major change for our beloved Jemez, and can only hope that luck and nature conspire!